On Friday, November 21, the Coral Gables Museum provided a sneak preview of the recently acquired Police and Fire Station, a building from Franklin Delano Roosevelt's New Deal program of the 1930's. This structure was constructed under the Works Progress Administration (WPA) program. Architect Jorge L. Hernandez, project architect of the new Coral Gables Museum, gave a guided "hard hat tour" of the new facility. See a detailed description of the interior spaces. Designed in 1938 by Architect, Harold D. Steward, the building was constructed of limestone. A newer section utilized reinforced concrete block. There is a Mediterranean bell tower. The building was recently acquired by the City of Coral Gables and will house the new museum. Mr. Hernandez is renovating it, adding 3,000 square feet to the historic structure. The new plan takes a large room that formerly housed a fire engine (on the north of the buidling) and converts it into an archive for man of the old Coral Gables documents. The renovation restores many of the original finishes, such as the exposed coral rock interior walls. A 5,000 square foot courtyard is also part of the new plan. The museum will open in 2010. Interior demolition has been completed. Architect Jorge L. Hernandez provides a "hard hat tour." This area of the building was formerly two-stories in height and the room has been opened back up. The concrete block indicates that it is not part of the original structure. View of the historic Police and Fire Station looking southwest. West elevation of Police and Fire Station. 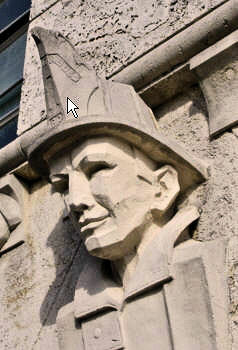 The fire engine doors were located on this side of the building and the coral rock busts of the firefighters can be seen in this view.